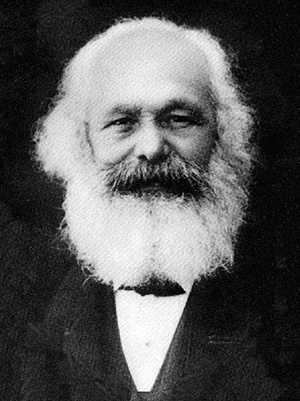 Karl Marx (May 5, 1818 – March 14, 1883) was a German philosopher, economist, sociologist, journalist, and revolutionary socialist. Marx's work in economics laid the basis for much of the current understanding of labor and its relation to capital, and subsequent economic thought. He published numerous books during his lifetime, the most notable being The Communist Manifesto (1848) and Das Kapital (1867–1894). Hegel has remarked somewhere that history repeats itself. He forgot, however, to mention: the first time as tragedy, the second time as farce. It is clear that the arm of criticism cannot replace the criticism of arms. Material force can only be overthrown by material force, but theory itself becomes a material force when it has seized the masses. Perseus wore a magic cap that the monsters he hunted down might not see him. We draw the magic cap down over eyes and ears as a make- believe that there are no monsters. Private property has made us so stupid and partial that an object is only ours when we have it, when it exists for us as capital... Thus all the physical and intellectual senses have been replaced by... the sense of having. The Irish famine of 1846 killed more than one million people, but it killed poor devils only. To the wealth of the country it did not the slightest damage. To be radical is to grasp things by the root. But for man the root is man himself.